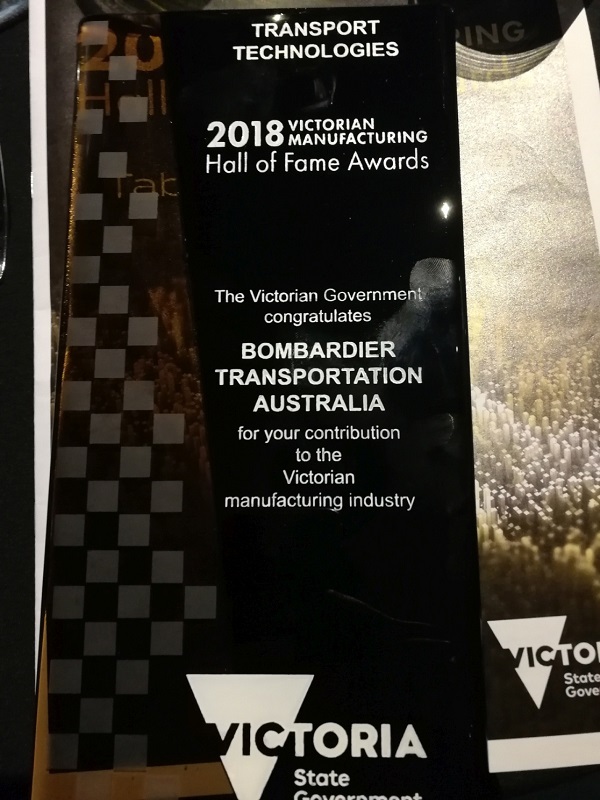 Rail technology leader Bombardier Transportation was honoured at the Victorian Manufacturing Hall of Fame Awards held on May 28, 2018 in Melbourne, Australia. These prestigious annual awards are hosted by the Victorian Minister for Industry & Employment and recognise outstanding achievements by local businesses and individuals across manufacturing and innovation in the Victoria region and beyond. Bombardier was proud to receive High Growth Sector: Transport Technologies award for 2018 and be recognised as a key player in Victoria's rail transportation ecosystem. "The greatly anticipated Hall of Fame Awards are a highlight for the manufacturing industry every year, and Bombardier is extremely honoured to have received such a prestigious award. This recognition reflects our commitment to delivering the mobility solutions that Victoria needs, and can be proud of, both today and into the future" said Andrew Dudgeon, Managing Director, Bombardier Transportation Australia. 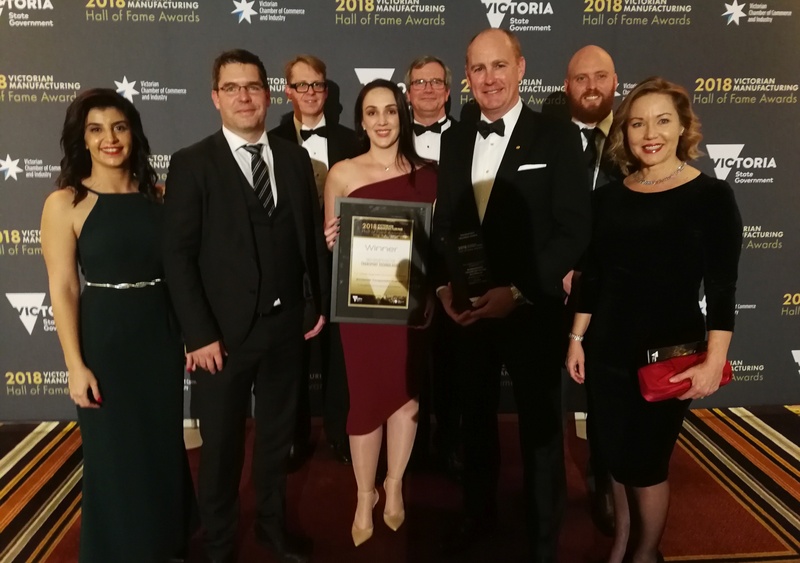 He added, "These awards confirm the strength of our local manufacturing in Australia, as well as our team's commitment to providing seamless rail transportation for both customers and passengers." 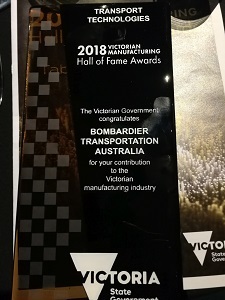 This respected award is a testament to the local manufacturing of our trains and trams which transform mobility across Victoria's rail ecosystem. Home to the largest tram network in the world, Bombardier's "Made in Melbourne, for Melbourne" BOMBARDIER FLEXITY E-Class trams are a famous and iconic symbol of the city. Coupled with Bombardier's locally build VLocity trains for the Victorian Regional Rail network, both projects have generated more than 500 local jobs, developed a robust supply-chain and continue to promote sustainable local manufacturing in Victoria. Bombardier has been investing in Australia for more than 60 years. As a trusted rail industry partner with over 1000 employees, Bombardier designs, engineers, manufactures and maintains rolling stock across Australia, along with providing signalling, rail equipment, asset management and through-life support to customers and operators. The Hall of Fame Awards, which were established in 2001, recognize individuals and companies who embrace new technologies and manufacturing techniques, are export focused and excel in business innovation. Bombardier and FLEXITY is a trademark of Bombardier Inc. or its subsidiaries.